periyavAchAn piLLai’s introduction to periya thirumozhi brings out the essence of sAsthram, i.e., emperumAn out of his causeless mercy reforms thirumangai AzhwAr and thereby uplifts many jIvAthmAs through him. Let us see that now. thirumangai AzhwAr had kept his AthmA (himself) in the hot sun and the body in the pleasing shadow. Keeping AthmA in hot sun means not engaging in bhagavath vishayam (spiritual matters) and keeping body in pleasing shadow means being attached to materialistic aspirations since time immemorial and having that as the goal in life. The real shadow is bhagavath vishayam only as it is said in “vAsudhEva tharuch chAyA” (வாஸுதேவ தருச்சாயா) meaning vAsudhEvan (krishNan) is the real shadow giving tree. He is the original/only pleasing tree which gives shadow that pleases us everywhere and all the time, This shadow can destroy any thApam (anguish) and is neither too hot nor too cold. Because thirumangai AzhwAr was very attached to vishyAntharam (material aspirations) which were pleasing to the eyes, emperumAn diverts his attachment from vishayAntharam to the many dhivyadhEsams and archAvathAra emperumAns who are most pleasing to the eyes and makes his mind fully fixed on archAvathAra emperumAns and gives him full anubhavam that AzhwAr cannot sustain himself without seeing emperumAn even for a moment. Further more, emperumAn converts him to be at the stage of nithyas/mukthas while he is here in this samsAram, develops his urge to reach paramapadham and ultimately benedicts him with paramapadha prApthi also. AzhwAr understands that “emperumAn only looked for AzwAr’s adhvEsham (that is bhagavAn is trying to help jIvAthmA every moment and jIvAthmA is rejecting his help since time immemorial, the moment jIvAthmA stops rejecting, that is enough for emperumAn to uplift the jIvAthmA – this adhvEsham is explained as adhikAri visEshaNam meaning a natural attribute of the jIvAthmA) and the limitations of material aspirations to reform AzhwAr, AzhwAr’s taste for material aspirations as the key (and diverted that taste towards emperumAn) and AzhwAr’s sins from time immemorial as the target of emperumAn’s mercy and blessed AzhwAr by first revealing the thirumanthram and emperumAn’s svarUpa (true nature), rUpa (forms), guNa (divine qualities) and vibhUthi (wealth)”. AzhwAr being overwhelmed by these favours of emperumAn, at once starts glorifying thirumanthram in his periya thirumozhi out of gratitude. It is the svarUpam of chith (sentient beings) to manifest the knowledge and insentient being devoid of knowledge cannot appreciate anything. Thus to demonstrate his gratitude and glorify emperumAn’s archAvathArams, AzhwAr sings these many divine prabhanahdams. Thus periyavAchAn piLLai establishes the nirhEthuka krupai (causeless mercy) of emperumAn and upAya sUnyathvam (devoid of performing any positive act to get the mercy of emperumAn) of AzhwAr in this vyAkyAna avathArikai. But once AzhwAr was divinely blessed by emperumAn, his attachment towards emperumAn becomes unparallel as he himself declares in periya thirumozhi 4.9.6 – “NummadiyArOdum okka eNNiyiruththIr adiyEnai” (நும்மடியாரோடும் ஒக்க எண்ணியிருத்தீர் அடியேனை) – “dont consider me like other adiyArs”. We have already seen more of periyavAchAn piLLai’s glorification of AzhwAr and mAmunigaL‘s glorification of AzhwAr in http://ponnadi.blogspot.in/2012/10/archavathara-anubhavam-thirumangai.html. 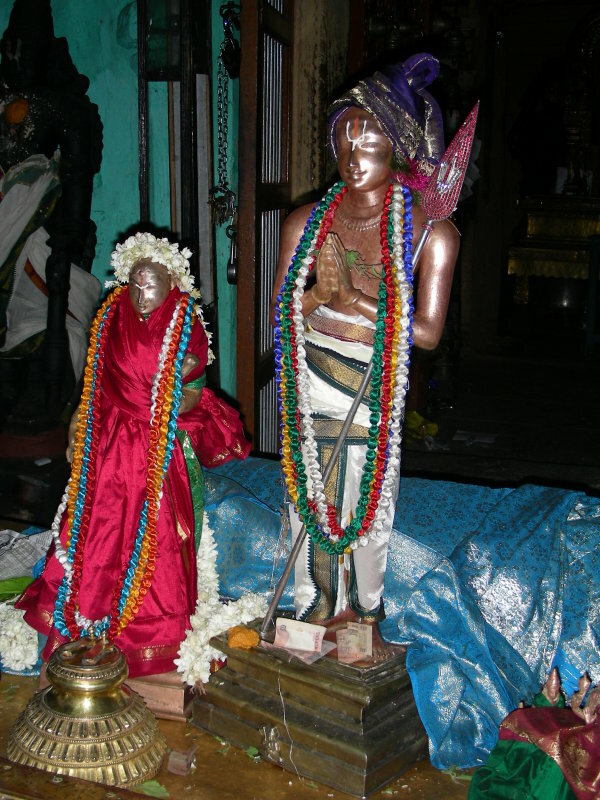 emperumAnAr (srI rAmAnujar) was declared by amudhanAr in rAmAnuja nURRanthAdhi, 2nd pAsuram as “kuraiyal pirAnadikkIzh viLLAtha anban” (குரையல் பிரானடிக்கீழ் விள்ளாத அன்பன்) meaning one who had unflinching attachment on thirumangai AzhwAr’s thiruvadi. parakAlan/mangai mannan’s divine form is always in my heart. This form is narrated as the one with the spear that is supported by the shoulder, the hands which are worshipping emperumAn, the beautiful Urdhva puNdram, the mouth which is saying Om, Sharp/slightly raised nose, cooling face, broad eyes, blackish hairs which are beautifully curled, ears which are perfectly built and which are slightly bent (to hear ashtAkshara mahAmanthram from emperumAn), well rounded neck, broad chest, strong shoulders, well shaped upper back, narrow waist, beautiful garlands, wonderful anklets, knees which reflect AzhwAr’s valour, slightly slanting divine lotus feet and the sword which will destroy all enemies. We can easily declare that kaliyan’s archA vigraham in thiruvAli-thirunagari is the most beautiful one in the entire creation. AzhwAr is also known as parakAlan, kaliyan, neelan, kalidhvamsan, kavilOka dhivAkaran, chathushkavi sikAmaNi, shat prabhandha kavi, kalivairi, nAlukavip perumAL, thiruvAvIrudaiya perumAn, mangaiyar kOn, aruL mAri, mangai vEndhan, AlinAdan, arattmukki, adaiyAr sIyam, kongu malark kuzhaliyarvEL, koRRa vEndhan, koRRavEl mangai vEndhan. With this in mind, let us see his charithram now. AzhwAr takes birth in thirukkuraiyalUr (near thiruvAli-thirunagari) as an amsam of kArmuka in chathurtha varNam and was named as neelan (dark complexioned) as identified in dhivya sUri charitham of garuda vAhana pandithar. While he grew up in his child hood without any attachment to bhagavath vishayam, once he became a youth he became very materialistic. He had a strong body and great fighting skills with knowledge in handling many weapons and thus went to the chOla bhUpathi (the king of the region) and requests him to include him in his army. The king being pleased with neelan’s abilities appoints him as a commander of his army and gives a small region to rule. In the mean time, in thiruvAli dhivya dhEsam, in a beautiful pond, some apsaras sthrIs (dancing gilrs from dhEva lOkam, etc) comes to play in the water. One such girl named thirumAmagaL (kumudhavalli) goes to fetch some flowers and her friends leave the place forgetting about her. She accepts a manushya sarIram (human form) and looks for some help. A srIvaishnava vaidhyan (doctor) comes by that side and enquires about him and she informs that her friends left her alone and the whole incident. Since he did not have any children, he happily brings her home and introduces her to his wife and they both happily accept her as their daughter and starts raising her. Seeing her beauty, some people go and inform about her to neelan and becoming very attached to her beauty, at once he goes to the bhAgavatha vaidhyar and starts a conversation. At that time, kumudhavalli goes by and the vaidhyar tells neelan that he is worried about marrying this girl to a proper man since he does not know her kulam, gOthram, etc. neelan at once tells the vaidhyar that he wants to marry her and offers him great wealth. The vaidhyar and his wife agrees to marry her to him but kumudhavalli puts forth a condition saying she will only marry a srivaishnava who has had pancha samskAram from an AchAryan. As it is said that an intelligent person will perform good things immediately, neelan at once runs to thirunariyUr and goes in front of thirunariyUr nambi and asks him to bless with panca samskAram. emperumAn out of his divine grace performs him sanka chakra lAnchanam and thirumanthra upadhEsam. Urdhva puNdram must be applied in 12 parts of the body, facing upwards with proper gaps in between and using white colored sand from dhivya dhEsams. Thus AzhwAr returned to kumudhavalli, wearing dvAdhasa urdhva puNdram and asks kumudhavalli to marry him. kumudhavalli says that she will marry him, but will accept him as husband only when AzhwAr performs thadhiyArAdhanam for one full year for 1008 srIvaishnavas every day without fail. AzhwAr agrees for the condition out of his attachment towards kumudhavalli and they both are married in a grand ceremony. Oh King! Worshipping vishNu is considered to be greater than worshipping any one else. Worshipping vishNu bhakthas is considered even greater than vishNu himself. As per the above pramANam, AzhwAr started performing thadhIyArAdhanam (feeding srivaishnavas with sumptuous prasAdham everyday) using all his wealth. Looking at that, some people go and complain to the king that parakAlan (AzhwAr) is spending all the wealth of the kingdom by just feeding the srIvaishnavas. The king sends his soldiers to bring AzhwAr to his court, but AzhwAr just speaks pleasantly to them and keeps them waiting. The soldiers insist that AzhwAr should pay his tax for the king, and AzhwAr becomes angry and pushes them out. The soldiers return to the king and inform him about the incidents. The king orders the commander-in-chief to go with the full army and arrest him. The commander brings a big army with him and attacks AzhwAr. AzhwAr being most powerful and brave responds back and drives the commander and his army out of their region. The commander returns to the king and informs AzhwAr’s victory. The strong king himself decides to fight with AzhwAr and brings his big army with him and attacks AzhwAr. AzhwAr again demonstrates his bravery and easily destroys the king’s army. The king becomes very pleased with AzhwAr’s bravery, declares peace and hails his glories. Trusting the king, AzhwAr goes near him, but the king cunningly arrests him through his minister and asks him to pay the pending tax. The minister brings AzhwAr and jails him inside a temple of emperumAn and AzhwAr fasts without taking any food for 3 days. It is said that, at that time, nAchiyAr of thirunaraiyUr tells thirunaraiyUr nambi that she cannot witness AzhwAr starving and brings some prasAdham to him. AzhwAr just stays fully surrendered to periya perumAL and thiruvEnkatamudaiyAn and keeps meditating on them. dhEva perumAL of kAnchipuram appears in the dream of AzhwAr at that time and informs him that there is a great treasure in kAnchipuram which will be given to him if he comes there. AzhwAr informs this to the king and king arranges AzhwAr to visit kAnchipuram along with great security. AzhwAr reaching kAnchipuram, does not find the wealth and dhEva perumAL being the one who gives everything to his devotees, appears in AzhwAr’s dream again and shows him the location of treasure on the banks of river vEgavathI. AzhwAr locates the treasure, gives the king’s share and returns back to thirukkuraiyalUr to continue with his thadhIyArAdhanam. Again after some time, the king sends his soldiers to collect tax, and again AzhwAr becomes filled with sorrow and again dhEva perumAL appears in his dream and instructs him to gather the sand from vEgavathi river and present that to the soldiers. When the soldiers receive the sand, it appears like invaluable grains to them. They happily carry that to the king and explains him all the details. The king then understands the greatness of AzhwAr, invites him to his court again, begs for forgiveness and submits great wealth to him. To atone for the offenses he committed to AzhwAr, the king spends his wealth by doing charities to dhEvas and brAhmaNas. AzhwAr continued his thadhIyArAdhanam and his wealth eventually became exhausted. He then decides to continue the kainkaryam even by robbing wealthy people who pass by his region. He robs the wealth people and performs thadhIyArAdhanam with great devotion. sarvEsvaran, thinking that, even if he is robbing the wealthy people, atleast he is spending the money in feeding srIvaishnavas thus being situated in charama purushArtham (ultimate goal), decides to uplift him from samsAram by blessing him with divine blemishless knowledge. As it is said that srIman nArAyaNan takes a human form (as AchAryan) and with the help of sAsthram uplifts the jIvAthmA who suffers in the samsAram, emperumAn starts going towards AzhwAr’s place along with nAchiyAr with wedding costumes as vayalAli maNavALan with beautiful ornaments and with a big wedding party. AzhwAr, being excited at the opportunity of getting a big bounty, surrounds the emperumAn with his wedding party and robs them of everything. Finally, AzhwAr bites off the toe ring from emperumAn’s lotus feet and emperumAn being greatly amazed at AzhwAr’s valour proclaims “Nam kaliyanO” (நம் கலியனோ) meaning Are you my kaliyan? (kaliyan means one who is great in valour). All the meanings of rg, yajur, sAma, atharvaNa vEdhams and their upabruhmaNams are contained in ashtaksharam itself. For the one who desires to attain salvation, ashtAksharam which is the essence of all vEdhAntham and one that can help cross the ocean of samsAram is the only refuge. Om should be recited first, followed by Nama: and NArAyaNAya; Om has one letter, nama: is made of two letters and NArAyaNAya is made of 5 letters (thus this manthram contains 8 letters and called ashtAksharam). Thus sAsthram gives the exact structure of ashtAksharam and how it should be recited without any doubt. ashtAkshara mahA manthram is the greatest manthram among all manthrams, most confidential one amongst the confidential manthrams, the purest one among the pure manthrams and is the eternal/ancient one. Beyond all of these, this ashtAkshara mahA manthram is the one which is accepted by pUrvAchAryas who are great intellectuals as said in thirumozhi 7.4.4 as “pErALan pErOdhum periyOr” (பேராளன் பேரோதும் பெரியோர்) meaning the great personalities who recite the names of emperumAn. Also, AzhwAr himself reveals in the first padhigam of periya thirumozhi itself as “peRRa thAyinum Ayina cheyyum nalamtharum chollai nAn kaNdu koNdEn’ (பெற்ற தாயினும் ஆயின செய்யும் நலம்தரும் சொல்லை நான் கண்டு கொண்டேன்) meaning I found the manthram that will do me good even better than ones own mother. After hearing the thirumanthram from emperumAn, emperumAn then shows him his divine form along with srImahAlakshmi who is mercy personified on the divine garudAzhwAr whose body shines like beautiful gold. He also blesses AzhwAr with divine blemishless knowledge out of his nirhEthuka krupai (causeless mercy). AzhwAr, after seeing all of those and understanding the blessing of emperumAn, which was triggered by srImahAlakshmi thAyAr’s purushakAram, blesses everyone with 6 prabhandhams – periya thirumozhi, thirukkuRunthANdakam, thiruvezhukkURRirukkai, siriya thirumadal, periya thirumadal and thirunedunthANdakam which are considered as 6 angams for nammAzhwAr’s four dhivya prabhandhams. His prabhandhams are made of different forms of poetry – Asu, madhuram, chitham and vistharam and thus became to be famously known as nAlu kavip perumAL. emperumAn finally orders AzhwAr to go to various dhivyadhEsams along with his sishyas and perform mangaLAsAsanam to various dhivya dhEsa archAvathAra emperumAns and disappears. AzhwAr along with his ministers and sishyas, starts his dhivyadhEsa yAthrai, takes bathe in many divine rivers and performs mangaLAsAsanam at srI bhadhrAchalam, simhAchalam, srI kUrmam, srI purushOththamam (puri jagannAth), gayA, gOkulam, vrndhAvanam, mathurA, dhvArakA, ayOdhyA, badhrikAshram, kAnchipuram, thiruvEnkatam, etc. He arrives at chOLa mandalam, his sishyas exclaim his glories “chathush kavi has arrived”, “kaliyan has arrived”, “parakAlan has arrived”, “One who won over all other mathams have arrived”, etc. A saiva scholar/bhakthar named thirugyAna sambandhar was living there at that time and his sishyas object to the glories of AzhwAr. AzhwAr at once says he will debate with sambandhar and establish nArAyaNa parathvam (supremacy). They bring him over to sambandhar’s residence and informs him about the same and he agrees to debate with AzhwAr. Since, the whole place/town was filled with avaishnavas and since there is no vigraham (form) of emperumAn, AzhwAr is unable to start speaking and starts worrying about the situation. 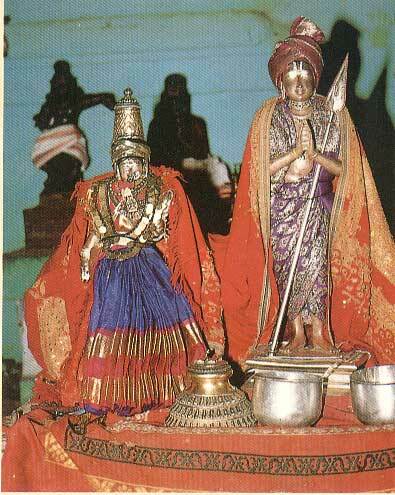 At that time, he notices a srivaishnava lady and asks her to bring her thiruvArAdhana perumAL (vigraham). She brings her emperumAn who is krishNan and brings him over to sambandhar’s place and starts the debate. sambandhar recites a poem and AzhwAr finds fault in that. sambandhar then challenges AzhwAr to recite a poem and AzhwAr recites “oru kuraLAi” padhigam (periya thirumozhi – 7.4) on thAdALan emperumAn (kAzhi chIrAma viNNagaram – sIrgAzhi). sambandhar unable to respond back for that great padhigam which is perfectly and beautifully composed wonders about the greatness of AzhwAr and accepts his glories and worships him. The most marvelous srIrangavimAnam is a manifestation of OmkAram; Its peak is vEdham itself. bhagavAn srIranganAthan is manifesting himself as the ultimate meaning of praNavam (which is the essence of thirumanthram). AzhwAr wanting to build a fort around the temple, discusses with his sishyas about getting the wealth to build the same. They reply that there is a vigraham of an avaidhiha matham in nAgapattinam which is fully made of gold and if we can acquire that we can do a lot of kainkaryam using that. AzhwAr at once leaves to nAgappattinam and finds a lady and asks her if there is any secret information in that town. She says that her mother-in-law use to say that there is a golden vigraham (deity) and the architect who made that vigraham and the most protective vimAnam where the vigraham is kept, lives in a different dvIpam (island/region of bhUlOkam). AzhwAr at once leaves to that place along with his sishyas and enquire about the architect who is comparable to vishwakarmA (the chief architect of dhEvas). The people direct AzhwAr to the palace which is huge and beautiful and AzhwAr reaches the palace. Along with his sishyas he started discussing about various things outside the palace and at that time the architect steps outside after finishing his bathing and meal. Seeing him, AzhwAr strategically says with great sorrow that “Oh! Some invaders came and destroyed the temple in nAgappattinam and took away the golden vigraham. Why are we still living in this world?”. Hearing this, the architect feels great pain, starts crying out loud and says “It must be one of the mischievous sculptors who revealed the secret to open the peak of the vimAnam through which any one can enter there. I made the most complicated key – a twisted iron chain inside a stone and kept that under the slab where the water falls and how did they break that?” thus revealing the actual secret unknowingly. AzhwAr along with his sishyas, at once leaves the place happily since the secret is known, and reached the seashore to return to nAgappattinam. He sees a virtuous merchant who is boarding his ship with a huge shipment of nuts (pAkku) and blesses him and requests him to leave them in the other side of the sea. He agrees and they all board the ship and begin the journey. On the way, AzhwAr picks up a nut, cuts it into half and gives it to the merchant and tells him that he will accept it back at the end of the journey and asks him to give a small chit with his signature saying that “I owe AzhwAr half the nut of my ship”. The merchant does so and after reaching nAgappattinam, AzhwAr asks him to give half the load of the expensive nuts in the ship (to use that in kainkaryam for srIrangam temple). The merchant is shocked and refuse to do so. They both argue and decide to go bring all the merchants together to get a neutral judgement and all the merchants declare that the merchant should give half the shipment to AzhwAr. The merchant without any choice gives the money for half the shipment to AzhwAr and leaves. AzhwAr and his sishyas then go to the temple and hide there until the night. In the night they break open the slab, retrieve the key, go to top of the vimAnam and opens the entrance by rotating it both sides and see the most shining vigraham. Seeing AzhwAr, the vigraham says “IyaththAl AgAthO irumbinAl AgAthO, bhUyaththAl mikkathoru bhUthaththAl AgAthO, thEyathEy piththaLai NaRchembugaLAlAgAthO, mAyappon vENumO mathiththennaip paNNugaikkE” (ஈயத்தால் ஆகாதோ இரும்பினால் ஆகாதோ, பூயத்தால் மிக்கதொரு பூதத்தால் ஆகாதோ, தேயதேய் பித்தளை நற்செம்புகளாலாகாதோ, மாயப்பொன் வேணுமோ மதித்தென்னைப் பண்ணுகைக்கே) meaning “Could you not just use iron, copper, bronze, etc? You needed me to be made of divine gold so that you can come and use me in kainkaryam for bhagavAn”. AzhwAr then gets his brother-in-law to fetch the vigraham and leaves the place with all of them. In the next morning, they reach a small town, where in a small farm land which was just ploughed, AzhwAr buries the virgaham for safety and rests there. When the farmers arrive there and start ploughing the field, they find the vigraham and declare that it was theirs. AzhwAr says it was his forefathers’ who buried it under the field. A debate follows and AzhwAr finally says that he will show a document in the next morning proving his ownership and the farmers agree and leave the place. AzhwAr and his sishyas, after sunset, leave the place with the vigraham, reaches uththamar kOil dhivya dhEsam and store the vigraham safely there. In the meantime, the temple incharge in nAgappattinam along with the local leaders come to know about the stealing of the vigraham and traces it upto the farm land where it was buried and finally reaches uththamar kOil. When they ask AzhwAr for the vigraham, he first says he does not know anything about the vigraham but subsequently says that he will restore the vigraham fully upto the finger to them in panguni month after the rainy season. He writes a document to that effect, signs that and gives that to them with his signature and they accept that and leave. AzhwAr immediately melts the vigraham, sells it to get money and starts building the fort around srIrangam temple. He runs into the nandhavanam (garden) which was setup by thoNdaradippodi AzhwAr and he carefully leaves that area un-disturbed with great reverence and builds the fort around the area. Being very pleased with thirumangai AzhwAr’s act, thoNdaradippodi AzhwAr names his gardening tool (shear/fork) as aruLmAri (one of the names of thirumangai AzhwAr) with great affection. Thus AzhwAr performed many such kainkaryams and showed his gratitude to emperumAn. After the rainy season, they come back looking for the vigraham. He asks them to read the document and as written in the document he returns a small finger. A debate rages and they go to the mediators and the mediators give their judgement that according to the agreement in the document, they can accept the finger and leave. They understand AzhwAr’s smartness and leave without even accepting anything. AzhwAr subsequently invites the architects of that temple and tells them that he wants to give some wealth to them and that wealth is in a nearby island. He gets them all boarded on a boat and after going some distance in the water, he signals to boatman, who jumps into a smaller boat along with AzhwAr and tilts the boat that carries all the architects and drowns them. AzhwAr returns to his place and the grand children of the architects arrive there and enquire about their grandfathers. AzhwAr tells them that he showed them great wealth in the island and they are packing them to bring them along over here. The grandchildren suspecting AzhwAr, tells him that they would not leave unless their grandfathers are brought back to life and returned to them. AzhwAr becomes very worried and srIranganAthan appears in his dream and tells him “Do not worry anymore”. He then asks all of them to go to Cauvery river, take a bath there, apply Urdhva pundrams and arrive at my main mandapam and invite each of their grandfathers by their names. They accept emperumAn’s orders and starts inviting their grandfathers one by one. To their astonishment, every one arrive from behind srIranganAthan and appear in front of them and tells them “By the divine grace of AzhwAr, we have now reached periya perumAL’s lotus feet. You also take shelter of him, be here in this samsAram happily for some time and get yourselves uplifted”. Following their grandfathers’ orders every one of them accept AzhwAr as their AchAryan and return to their place eventually. periya perumAL then asks AzhwAr if he has any desires. AzhwAr tells periya perumAL that he wants to worship emperumAn’s dhasAvathAram. periya perumAL tells him “If that is your desire, you can install my archAvathAra vigrahams of dhasAvathAram” and at once AzhwAr builds the sannidhi for dhasAvathAra emperumAns in srIrangam. Subsequently, periya perumAL invites AzhwAr’s brother-in-law and orders him to make an archA vigraham for AzhwAr (since AzhwAr is his brother-in-law’s AchAryan) and install the same in thirukkuraiyalUr, build a beautiful temple there and celebrate AzhwAr’s uthsavams in a grand manner. His brother-in-law, immediately gets archA vigrahams made for both AzhwAr and his wife kumudhavalli nAchiyAr, goes to thirukkuraiyalUr with everyone and installs the archA vigrahams there and performs grand uthsavams there. AzhwAr continued to uplift all his sishyas and others and spent his life constantly meditating on periya perumAL as both upAyam and upEyam. His archAvathAra anubhavam is already discussed in here – http://ponnadi.blogspot.in/2012/10/archavathara-anubhavam-thirumangai.html. This entry was posted in AzwhArs, other AchAryas and tagged azhwar mamuni ramanuja, kaliyan parakalan thirumangai on January 23, 2013 by sarathyt.